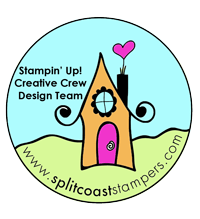 Inspiration Challenge | Stampers With Altitude!!! We were given three images to inspire a card. A sideline of mine made a card that helped me bring this card to fruition. Her card was very different but still had a sunflower on it. I was moved to make this card by seeing that card and this image. This card uses a few different things. I used the Layering Circles framelits for the flower’s center. I used the Eastern Medallions thinlets for flower. The stem uses the Flourish Thinlets. I used Whisper White Thick card stock, Crushed Curry, Chocolate Chip, Tranquil Tide and Whisper White. On the sides, Eastern Gold Vinyl Stickers were used. I sponged the flower with Chocolate Chip ink and Wink of Stella Clear. It gave the flower a gold-ish glittery look. What do you think?